How Corrupt is the United States? The United States ties with Belgium as the 18th least corrupt member of the OECD. These findings gibe with what several friends in the international investment community have told me. In their view the United States has slipped in its commitment to the rule of law. At the margin, that makes places like New Zealand, Australia, and the Nordics more attractive places to invest. About the Transparency International numbers: TI creates its Corruption Perceptions Index by aggregating 13 corruption surveys performed by other organizations (e.g., the World Bank and the Economist Intelligence Unit). As The Economist notes, the TI methodology raises some questions. 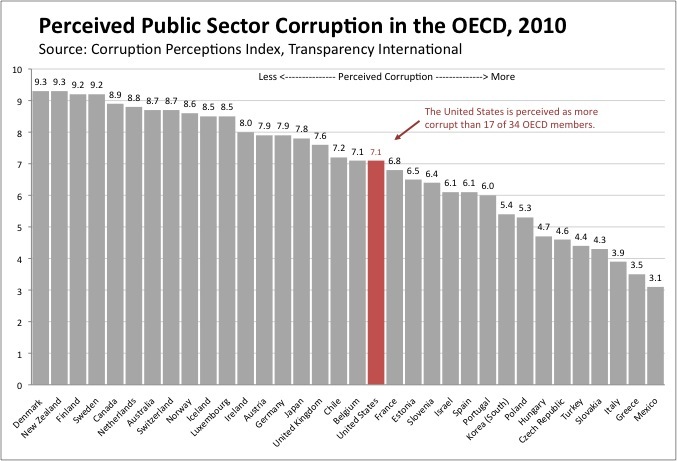 But it’s still an interesting snapshot of corruption perceptions in the world. BEA released its first estimates for third-quarter GDP yesterday. Headline growth was a disappointing, if not surprising, 2.0%. Housing fell back into the red, while non-residential structures eked out a small gain. Consumers continued to spend at a moderate pace (consumer spending grew at a 2.6% rate, thus adding 1.8 percentage points to growth). 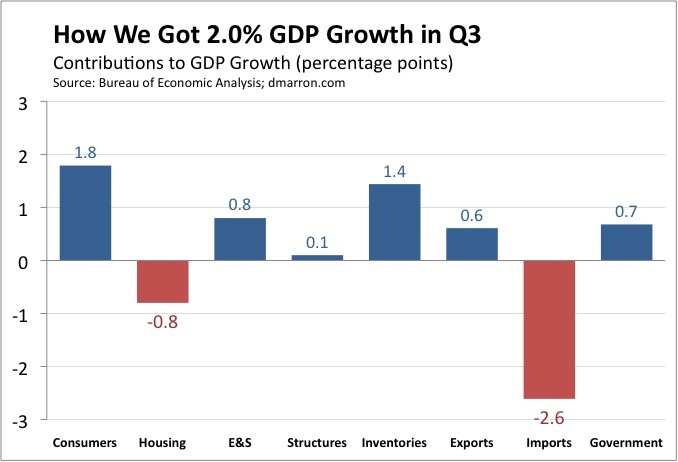 But the big stories were the continued boost from inventories, and the continued drag (in GDP-accounting terms) from imports. The pessimistic take on inventories (see, for example, this tweet from Nouriel Roubini) is that the third quarter build up was unintentional, and thus is bearish for fourth quarter growth. The optimistic take, I suppose, is that maybe businesses see stronger demand ahead. But that feels rather, er, speculative. For my usual set of caveats about the import figures (and, therefore, all of these figures), see my last post on the GDP numbers. Tim Kane at the Kauffman Foundation is out with his latest survey of economics bloggers (full disclosure: I am both an adviser to the survey and a participant in it). Among the more amusing responses from other bloggers: taupe and flirtatious. You can find the full survey results here. Collecting and disseminating useful data about the economy, government finances, demographics, health, the environment, etc. can be a difficult business. Survey methodologies and estimation techniques are inevitably open to legitimate criticism and also attract a good deal of not-so-legitimate criticism (for examples of both, see the debate over the “birth death model” in estimating payroll employment). But all in all, I think our official statisticians perform a valuable service. I commend the dedication that many statistical experts bring to their reports and publications. They carry out an essential public service — one that promotes peace and democracy by giving citizens reliable and impartial public information about their communities. Their core values — service, integrity and professionalism — deserve full support in all nations. Housing starts and permits usually dominate the headlines on residential construction data day. In September, for example, single-family starts increased a healthy 4.4% (total starts increased 0.3%), and single-family permits rose 0.5% (but total permits declined 5.6%). Those are certainly important measures, but I also like to look at a third measure of residential activity in the report: the number of single-family houses under construction. The number of single-family homes under construction at the end of September fell to just 269,000, down about 14% from a year ago. 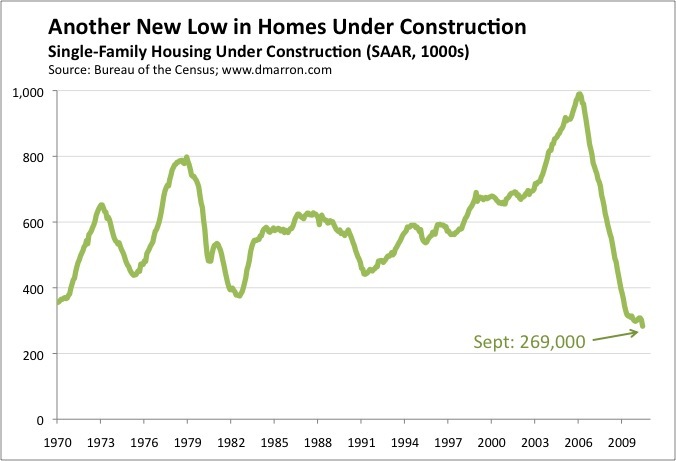 I had once hoped that the housing market was putting in a bottom, with homes under construction plateauing at about 300,000. But we’ve now witnessed five straight months of declines. Can the Chilean Miners Solve the Cartel Problem? 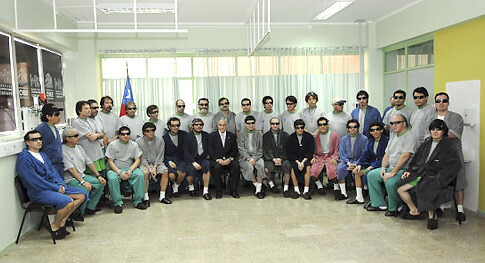 The rescue of the Chilean miners was a heartwarming miracle. The miners have both my sympathy and respect – I can’t even begin to imagine what those first 17 days were like, trapped far underground without any hint that rescue was even possible. I wish them the best as they try to return to normal life. I also thank them for providing an excellent case study for my microeconomics class. According to media reports, the 33 miners agreed to a pact of silence in which none will speak about the details of the first 17 days of their ordeal. In addition, they struck an agreement to coordinate the telling of their story and to share equally the resulting profits. In short, the Chilean miners formed a cartel. A justified and moral cartel to be sure — they deserve whatever profits they can jointly extract from their ordeal — but a cartel nonetheless. All of which raises a natural question: Can such a cartel be successful? Or will it succumb to the perennial challenge that confronts all cartels: how to enforce a joint agreement in the face of individual temptations? A unified silence may well maximize the financial value of the story and defend the privacy of those moments that some miners do not want to share with the world. But the media circus will tempt some miners to cheat on that agreement either for monetary gain or to ensure that their individual perspective gets reported. Some of the rescued Chilean miners are apparently willing to tell their story for the right price, despite a promise made between all 33 of them that none would reveal details about the worst of their 69-day ordeal buried underground. During a special Sunday mass held in honor of last week’s dramatic rescue, miner Jorge Galleguillos said that the pact was non-binding and hinted that he’s entertaining offers to spill the beans on exactly what happened. “I have to think about myself,” he argued, without going into specifics about what information he’d be willing to share. There are also rumors that some of the miners have already reached deals to tell their story. El Mercurio reported last week that Victor Segovia agreed to sell the contents of the journal he kept during his time in the mine for $50,000 to German newspaper Bild. My prediction? Regardless of how this turns out, the Chilean miners will show up in the next edition of many economics textbooks.